What: Birdwatching, warbler migration, nature. Why Responsible: Support of local guides, inns, businesses, critical habitat acquired, preserved and maintained by local organizations. What is the best part of the spring warbler migration? Aside from witnessing the amazing journey of tiny rainbow-colored birds as they fly thousands of miles from as far south as Peru, to as far north as Arctic, it might just be the great people you meet along the way. Two of my favorite warbler-following friends, Gerry Griffiths from England, president of Avian Adventures and Elise Boeger from Manhattan, plus some folks from here and from England will greet the feathered migrants in Central Park then follow them in their annual pilgrimage north up the Hudson River Valley. The adventure begins in just a few short weeks and you are invited! THIS BLACKBURNIAN WARBLER RESTING IN CENTRAL PARK, NEW YORK MAY HAVE ALREADY FLOWN FROM AS FAR AS BOLIVIA, SOUTH AMERICA 3990 MILES (6400 KM) AND HE STILL HAS FURTHER TO GO. IMAGE: THANKS TO RAY TIPPER AND AVIAN ADVENTURES. The little jewel-like birds may be single-minded in their quest (read more about them here), but as we follow them, we humans will relax and explore nature, stay in little inns, and enjoy some of the freshest, most delicious local cuisine, wine and beer in the U.S.A! Manhattan's Hotel Wales, a lovely little boutique hotel a couple of tree-lined blocks from Central Park, is an oasis in the city. It is just a few minutes ride, but a world away, from the hustle of New York’s mid-town. EVEN IN MANHATTAN THERE ARE QUIET CORNERS WITH LOCAL-OWNED RESTAURANTS AND SHOPS FULL OF FRIENDLY PEOPLE. THE HOTEL WALES, ONLY BLOCKS FROM CENTRAL PARK, IS LOCATED IN ONE. IMAGE: THANKS TO HOTEL WALES. This year our warbler tour will take us as far north as Fort Edward, New York. Gerry, Elise, and I got together to plan. Roberta: "Elise, why is Central Park so special? Why do the warblers come here?" Elise: “Central Park’s 843 acres (341 hectares) is located along the important birding migration route (called) the Atlantic Flyway. For hundreds maybe thousands of years, they have followed it in spring and fall from the Southern U.S., Caribbean, Central and South America, to their breeding areas in North America and back again. Roberta: "The park has many different sections, some, like the Conservatory Garden, are structured, some like the Lock or the Turtle pond seem less tamed. What is your favorite?" Elise: “My favorite area in Central Park is the Ramble. 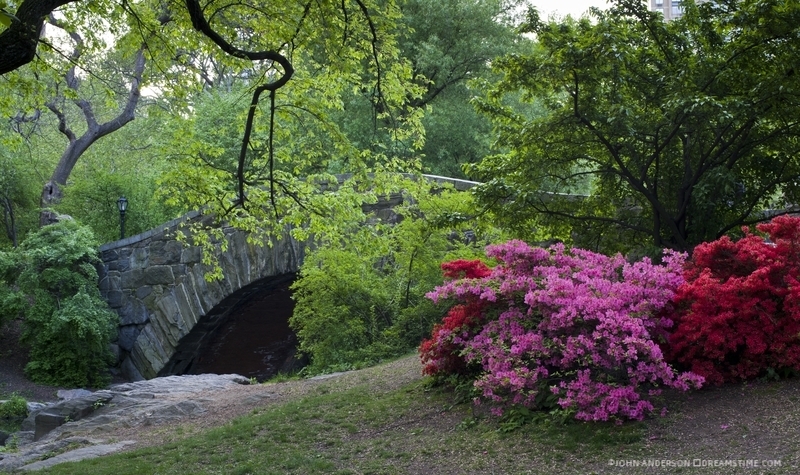 Frederick Law Olmsted, Designer of the Park, considered these 36 acres his “Wild Garden” … a tranquil escape from urban life. Roberta: "Yes, a lot of folks come to Central Park and never explore this mysterious forest-in-the city. What birds can we expect to see there?" Elise: "The annual spring and fall migrations (brings) the beautiful Eastern wood warblers, and other magnificent songbirds, or Neotropical Migrants, (and) tanagers, thrushes, vireos, swallows, orioles, and our birds native to New York City." Roberta: "What is your favorite first stop outside the city?" Elise: "A great place to stop along the Palisades on the way up is State Line Lookout. 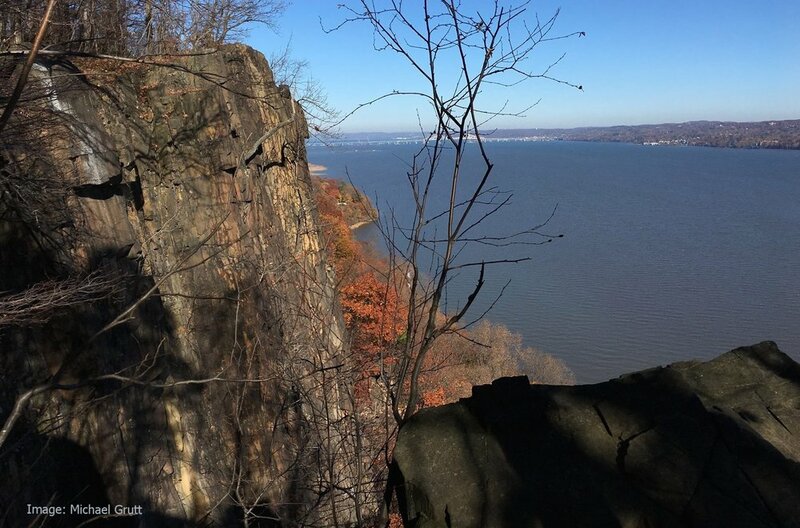 (There is) an incredible vista overlooking the Hudson River. This is also a prime spot in the fall, with the migrating raptors on their flight south." Roberta: "Yes, I love that rest stop! It is high above the Hudson River. Last year we witnessed a peregrine falcon soaring above the river, but eye level to us, so close we could almost reach out and touch him! And they have good coffee there - a morning must for this caffeine dependent nature lover." Doodletown is considered a "real live” ghost-town, established around 1762 it was abandoned in 1965 to become part of Bear Mountain State Park. Foundations of the little houses, schools, and churches are still visible among the trees. Stone bridges over the streams are a lovely place to rest and watch the water meander around the rocks where turtles sun themselves and delicate butterflies flutter by. From Doodletown we will all head up along the Hudson where myriads of small towns are chock full of history, cozy inns, and great food. As the city disappears behind us nature begins to work her magic, you will probably find yourself feeling a little lighter, breathing a little deeper, and smiling a lot. Do not worry. It is a “natural” reaction. Further north along the river, just east of Albany is the Rensselaer Plateau and Forest Tract. 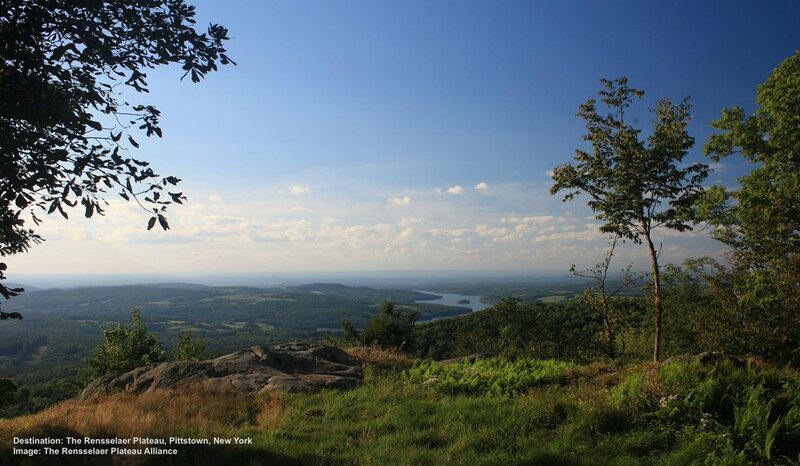 At 118,000 acres (47,750 hectares), it is one of the largest and most ecologically intact habitats in New York State. MANy MIGRATING WARBLERS REST OR BREED IN THE RENSSELAER FOREST PLATEAU. HERE WE MAY SEE (IUCN VULNERABLE) CERULEAN, BLACK THROATED BLUE, OR PRARIE WARBLERS, AS WELL AS ANIMALS SUCH AS NORTHERN RIVER OTTERS AND MAYBE EVEN A MOOSE! IMAGE THANKS TO RENSSELAR PLATEAU ALLIANCE. This very special expanse of forest and wetlands is a favorite breeding spot for a lot of at-risk warblers like the black-throated blue and others. Moose, bob cats, and endangered Northern otters like it too! BLACK-THROATED BLUE WARBLERS, LIKE THIS MALE, WINTER IN PANAMA AND THE CARIBBEAN THEN MIGRATE ANNUALLY TO BREEDING GROUNDS IN AS FAR NORTH AS SOUTHERN ONTARIO AND QUEBEC, A JOURNEY OF ABOUT 4600 MILES (7500KM ) IMAGE: THANKS TO GERALD GRIFFITHS AND AVIAN ADVENTURES. BLUEBIRDS (NEW YORKS'S STATE BIRD), LIKE THIS ADULT AND FLEDGLING, ARE BECOMING YEAR-ROUND RESIDENTS HERE, POSSIBLY DUE TO CLIMATE CHANGE. SARATOGA NATIONAL HISTORIC PARK HAS PLACED 78 TRAIL BOXES WHERE THEY CAN SAFELY NEST. IMAGE: GORDON ELLMERS. Saratoga National Historic Park, named for the important part the area played in our Revolutionary War, combines nature with history. You cannot help but laugh when the park rangers delightedly tell the story of how the British army got their collective butts kicked here. They get so enthusiastic that even our British friends are cheering at the end. This was one of the very few battles the Brits lost during the revolution. It is also where I (nearly) saw the biggest of all living woodpeckers, the pileated. These fellows are so big you will swear they are left over pterodactyls. 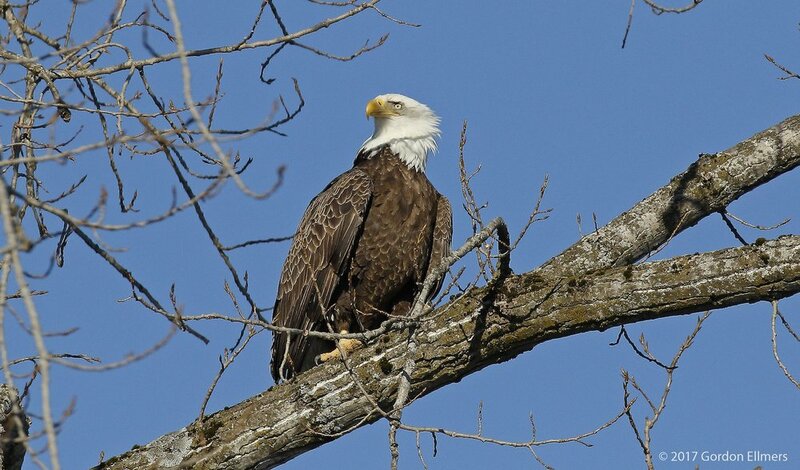 From Warblers to Eagles, Fort Edward, N.Y.
A BALD EAGLE'S NEST CAN WEIGH HUNDREDS OF POUNDS. PLATFORMS PLACED IN THEIR HABITAT REGIONS, LIKE THIS ONE IN FORT MILLER, NEW YORK PROTECT AND ENCOURAGE THE BIRDS. OSPREYS ALSO LIKE THESE PLATFORMS, THE COMPETITION MAKES FOR FABULOUS ARIEL DISPLAYS. IMAGE: GORDON ELLMERS. Expect to see the big raptors too! Bald eagles, majestic and fierce-looking, also breed up here. Their nests are 4 to 5-feet (1.2 - 1.5m) across and 2-feet (.6m) deep and bigger. The largest recorded (St. Petersburg, Florida) weighed 3 tons! 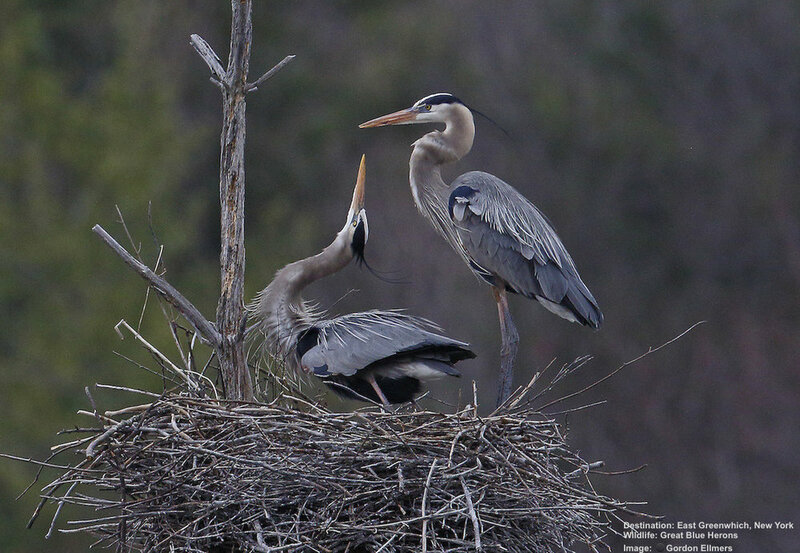 Get Ready for Great Blues - Herons That is! And then there are the great blue herons. I was totally amazed to find that these tall long-legged birds (up to 4.5-ft / 1.4m) nest in trees in social groups called “rookeries.” To see the great birds building a nest or bringing food to each other is to witness an aerial ballet with no equal. Even if you have never “bird watched” before, the spring warbler migration is a moment in nature you want to experience at least once in your life. Find the Warblers - with Friends! 1) Central Park: Families & adults. 2) Central Park and the Hudson River Valley: Adults Only 2019 Warbler Tour now open for reservation. Join Avian Adventures' Gerry Griffiths and Elise for 10 days. Explore Central Park, and Jamaica Bay then follow the tiny migrants up the Hudson River Valley. This year we will spend 2 nights in Bear Mountain exploring Doodletown, a ghost town and favorite nesting site of the cerulean warbler, then on as far as Fort Edward, NY. Stay in locally owned hotels, enjoy fresh local meals, and arrive back in NYC with time to explore Central Park one more time. We will celebrate and say farewell with dinner in a wonderful locally owned bistro. No previous birding experience necessary. Bonus: Back by popular demand! While in Manhattan we will enjoy an Evening Harbor Cruise taking in the magnificent new york skyline and getting an up-close view (and photo op) of Lady Liberty herself all lit up in the soft evening light. Nature, warblers & other song birds, nesting osprey, and nesting bald eagles, comfortable accommodations, delicious fresh local food, and great company including two world-class birdwatching leaders and a private expert birding guide in Central Park and the Washington County Grasslands. Bump Your Exposure! What to Do When the Bird is a Bear.